Seeking out and choosing an online counselor for therapy services is an important first step to a healthier you. We know this because our management team of psychologists, nurse practitioners and health care executives that have been on both sides as clients, family members, and providers. iTherapy has done the research for you by selecting the best professionals from around the world and assembled them for you in one online platform. iTherapy allows you to meet and select a licensed, caring counselor in a fully secure and confidential setting. You can feel at ease that our counselors are among the best in their respective fields of specialty, have undergone arduous screening and verification and were hand selected by our experts. What do Counselors Do ? Professionally trained counselors use scientifically validated procedures to help people develop healthier, more effective habits. Counseling provides a supportive environment that allows you to talk openly with someone who’s objective, neutral and nonjudgmental. You and your counselor will work together to identify and change the areas you select to help you be the person you want to be. How Do I Choose the Right Counselor ? Studies have shown that the most important component of successful counseling is the connection between the therapist and the client. With that mind, you should first make sure that your counselor has expertise in the areas that want to focus on. Once that has been determined you should make sure you feel comfortable with the therapist and that you will be able to open up and be honest with them. You might have to meet with more than one counselor before you find the right one, but you are important and worth the effort. Start your Path to a Better you Today! iTherapy provides information on the various areas of expertise covered by our counselors. Please select the area below in which you are interested. To meet an iTherapy counselor serving your area, please select your state. 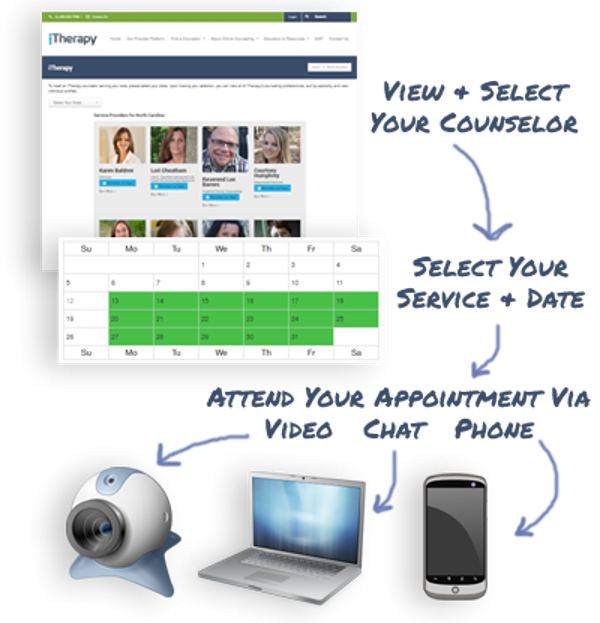 Upon making your selection, you can view all of iTherapy’s counseling professionals, sort by specialty, and view individual profiles.